Last Chance with Derek Chance is your typical late night talk show hosted by a failed star who’s returned to his eccentric hometown full of offbeat characters. Since his dreams of making it in Hollywood fizzled out, Derek grasps for his final shot at fame with his own late night show. The show is cobbled together on a shoestring budget and run out of the basement of Derek’s newly-single aunt/co-host in their hometown of Frankendale, USA. Frankendale is a small, insular town full of hardworking, idiosyncratic people. The show follows the standard late night format with monologue jokes, desk bits, recurring segments, satirical commercials, and guest interviews all from the perspectives of the good and strange people of Frankendale. 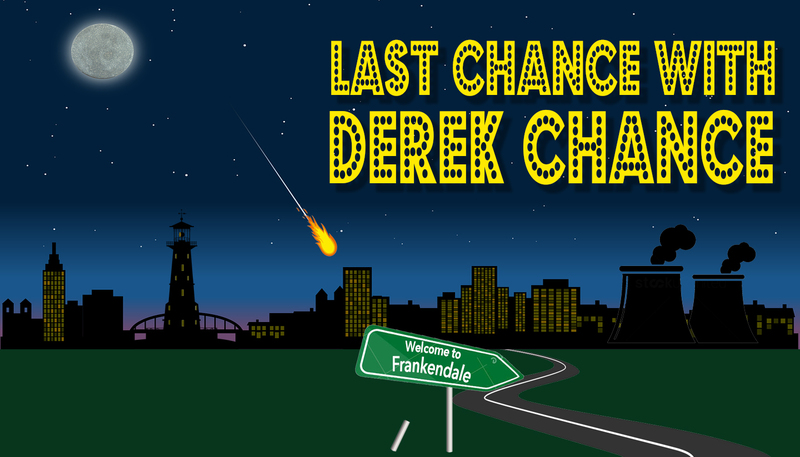 Last Chance with Derek Chance is a late night show that brings together a community. A community that probably shouldn’t be in the same room. $10/$1 with SC ID.